Jack Close was born in 1925. 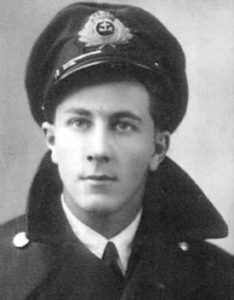 After training as a Wireless Operator at his local Technical College, he joined HM Rescue Tugs Service in 1943. On 20 December 1943 he joined the Rescue Tug Eminent in Glasgow. In the weeks leading up to D-Day Eminent took part in exercises in the Channel, practising towing what turned out to be components of the Mulberry Harbours. The extracts that follow are taken with Mr Close’s kind permission from his Memoirs, ‘Beyond the Horizon’, published in 2010. The noise of the bombing and gunfire increased as we neared the far shore. Approaching the beach landing area we passed close to the Rodney which was firing her 16inch shells continuously. The battleships Warspite and Ramillies, which had overtaken us earlier, had joined the cruisers Belfast and Diadem in bombarding targets inland. The shock waves from their guns could be felt in the air and up through the ship’s hull. E-boats were reported in the area. A ship to starboard of us was set on fire, probably a tanker judging by the size of the explosion. Wireless messages from the beach to the ships offshore were coming thick and fast, in plain language. We stayed off the beachhead for the next 36 hours, holding onto our tow and keeping out of the way of the landing craft and other vessels passing us on the way to the beach, waiting until working parties and small craft had cleared sufficient space to allow the securing of our roadway onto the shore. Dusk was falling when we left … Picking our way through the shipping that was milling about off-shore, we set off home along the northbound channel. Midway across, we came upon an American coast-guard vessel that had broken down and was drifting; we threw her a line and towed her back to England. We were otherwise unhindered, made good speed of 10 knots or more and reached the Solent as dawn was breaking. We left Omaha beach to return home and were about ten miles offshore when an intensive barrage started up. Flares were being sent up all around us and the nearby cruisers were firing their smaller weapons continuously. It was a pitch-dark night and the whole scene was threatening, most of the flares being right above us. The activity continued for some time and at about one-thirty in the morning two E-Boats shot out of the darkness straight across our bows. As we were at continuous action stations all our guns were manned, and we opened fire. The Captain said that he felt certain we had hit one of the E-Boats before they vanished into the darkness as swiftly as they had come. There was a lot more hostile activity around us in mid-Channel throughout the night, the enemy had by now recovered from their initial surprise and were hitting back wherever they could. We could not bring our half-connected and unwieldy mass of concrete close in-shore because, if matters took a turn for the worse, we were capable of destroying Mulberry A and half the shipping in it single-handed. We were doubtless not the only ones to feel apprehensive about the situation. It must have been alarming for large vessels like the Arkansas, Texas and Glasgow, busily engaged in bombarding targets ashore, to see a small concrete mountain apparently out of control bearing down on them. We received a number of frantic messages, both on Aldis-lamp and by wireless, all of them curt and unfriendly, telling us to keep clear. To make things more interesting, the Chief rang the bridge to advise that we were running low on Luboil and that he would have to shut down one of our engines. The tenuous grasp we had on controlling our tow disappeared at this juncture. We had 6,000 tons of dead-weight concrete only partly attached to us, were now working on one engine instead of two and were bearing down on a very congested and busy anchorage in choppy waters, with gale force winds from seaward making matters worse by the minute. We could tell our friendly neighbourhood battleship about our misfortunes and induce instant apoplexy, but there seemed little point. The shore line was a jumble of landing craft mixed with chunks of the battered harbour, and other wreckage bobbed drunkenly around the anchorage, so their pointed advice to us by lamp to keep clear of all shipping in the anchorage went straight over our heads. We were largely hostages to fortune, no longer in control of our own destiny, nor theirs either had they but known. The Eminent was finally able to manoeuvre the Phoenix into position on the evening of 22 June and return to England after what Jack Close describes as his ‘longest and toughest trip.’ He completed a fifth and final cross-Channel trip with a Phoenix in tow at the end of June.